Other fanned fret instruments are available, but not at this price: an eye-catching and relatively affordable way to test the concept. Imaginatively designed and beautifully built. Clarity of tuning and sound. Enhanced harmonics. Difficult to access preamp battery. Not to all tastes. Everything about Avian seems cutting-edge. British-owned with a head office in Hong Kong, the instruments are made in China but designed by US luthiers Michael Baskin and Harry Fleishman. 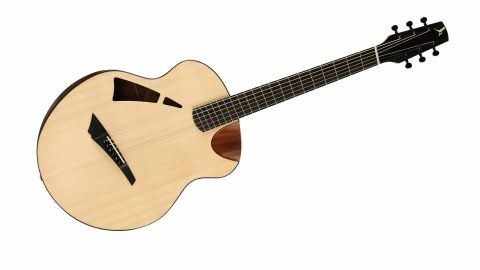 Its range of instruments is characterised by the innovative and the downright quirky, especially this Skylark , with its modernistic design, unusual soundhole, armrest and demi-cutaway. Here, however, another forward-looking concept is introduced: fan fretting. "The instrument is very refined and if an instrument can actually improve your playing, this one did!" The fan fret concept is not as daft as it may appear (and can apparently be traced back to the 16th century). Instead of a regular guitar's single scale length, like a piano the scale increases from treble to bass. So here, for example, we go from a standard scale of 25 inches on the treble side to 25.75 inches on the bass string, which accounts for the offset bridge and nut angle and the resulting 'fanning' of the frets. Some argue that ergonomics and playing comfort are improved, but the startling difference is in the tone created by a more uniform tension across the strings. The definition of harmonics is enhanced, and non-harmonic overtones and unwanted noise are diminished. The G and B strings - the point at which the change from wound to plain strings occurs - is often a problem area for intonation and tuning. This is seemingly improved by the more even tension. "The fan frets may seem unconventional, intimidating, even pretentious - but from the outset, chord shapes simply fall under our fingers"
In addition, the envelope of decay is stretched too, giving quite a different, conveniently, piano-like quality to the sustain. This model is fitted with the B-Band A2.2 dual-source pickup, and it's not without issues. There's a transducer under the saddle (UST) and another on the underside of the top (AST). A preamp is Velcro'd inside, next to the battery, and a pair of discreet controls - for volume and balance of the two sources - are mounted on the inner rim of the soundhole. The restrictive shape and size of the hole, however, makes it impossible for this writer to reach into the guitar to remove/ replace the battery or the preamp. Initially, we found the signal to be a little thin and a little noisy, though not unusably so. The application of some smaller hands, however, allows the preamp to be removed and the outputs of the two pickups adjusted, which immeasurably improves the sound. The vanilla Skylark impressed in our earlier review. Imaginatively designed and beautifully built, the instrument is very refined and if an instrument can actually improve your playing, this one did! Built with scant regard for the past, the whole ethos of this guitar is unapologetically forward-looking and that is gloriously apparent in its sound: where it counts. The fan frets may seem unconventional, intimidating, even pretentious - but from the outset, chord shapes simply fall under our fingers and the clarity of tuning and sound that multi-scaling achieves is beautiful. For this reviewer, the fan-fret idea absolutely sells itself.